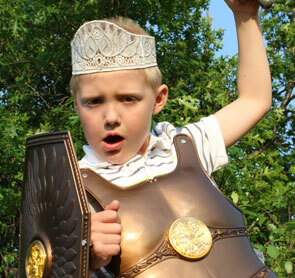 Heroic knights and beautiful princesses, great adventures and magical unicorns, important quests to conquer the dragon -- fairy tales have come to life with these new fantasy designs! All new designs this week are inspired by classic fairy tales and bedtime stories. 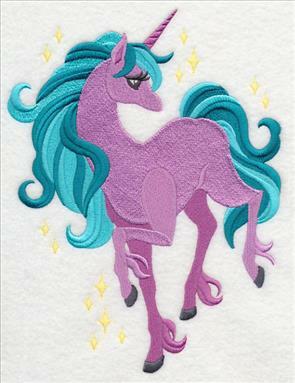 Stitch a slew of unicorns (there are eleven to choose from!) 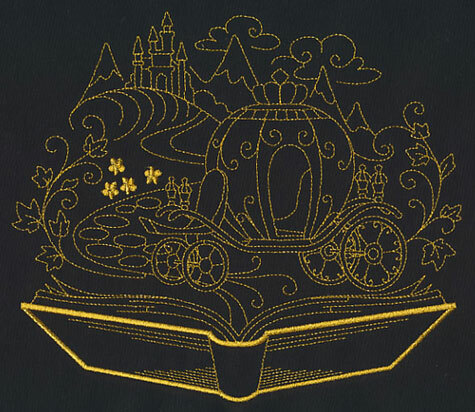 or add a storybook design to bring a magical look to your embroidery projects. New princess and knight designs are perfect for kids decor, while freestanding lace crowns will delight your little princes and princesses. Each of the new designs are perfect for your next fantasy-loving project! 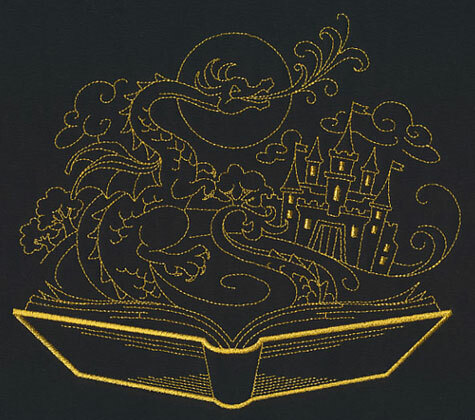 Be the author of your own fairy tale with a fun on-the-go storybook! 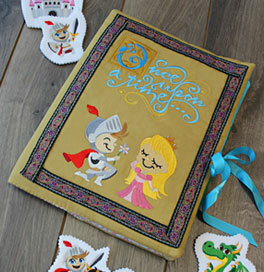 Fun and playful storybook designs are the perfect way to build your own fairy tale. A stunning castle sets the stage for the fantasy, while a knight gallantly honors his princess in these designs. 6.48" x 4.72" and 3.85" x 2.93"
Shine the spotlight on the heroic knight and beautiful princess in this fun tale. 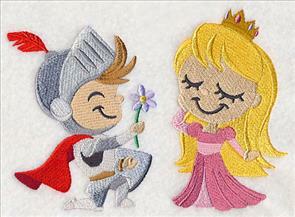 A sword and shield help the knight defend his one true love; the princess shows her sweet side with a lovely butterfly. 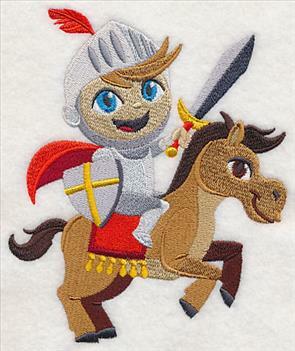 3.38" x 4.70" and 2.17" x 3.00"
Finish your storybook series with an adorable depiction of a courageous knight riding in to defeat a ferocious dragon. 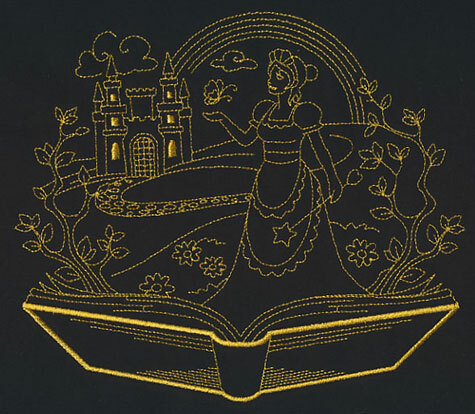 Each of the designs can be stitched separately, or paired to tell your perfect fairy tale ending. You can also turn these designs into magical magnets. 4.83" x 4.88" and 3.82" x 3.86"
Create your own fairy tale adventure with these playful designs. Choose your favorites by using the links above, or get all six in a design pack for an even deeper discount! 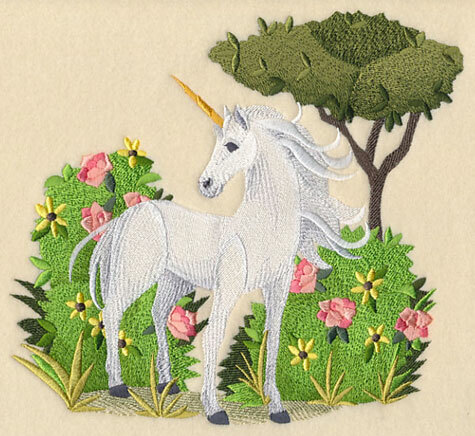 A graceful and sophisticated unicorn brings fantasy to life in this magical garden design. 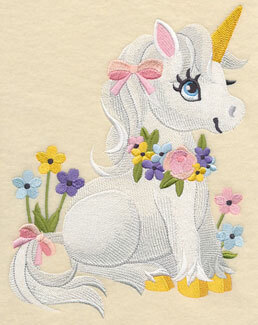 A light breeze plays with its mane and tail, while beautiful flowers and plants surround the unicorn. 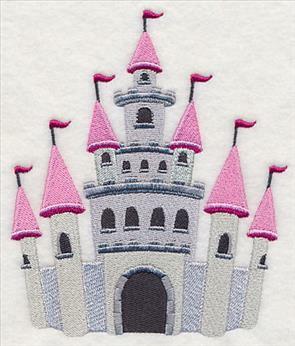 Stitch this enchanted design on pillows, book bags, wall hangings, quilts, and more! 7.78" x 7.56" and 7.06" x 6.88" and 6.03" x 5.85" and 5.01" x 4.86"
Bright, colorful flowers inspired by painted works of art contrast beautifully with light, sketch-style mythical creatures. 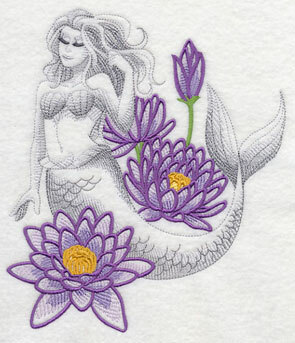 A mermaid and fairy make lovely, sophisticated additions to a variety of embroidery projects, including pillows, tote bags, and bath decor. 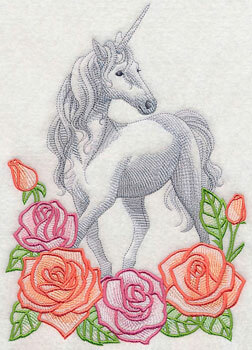 6.90" x 9.31" and 5.78" x 7.80" and 4.85" x 6.55"
Elegant unicorns are beautiful when stitched in a sketch-style. 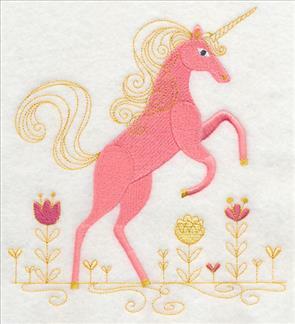 Try a unicorn-and-roses design as a stunning embroidered embellishment on apparel or tea towels; a majestic moonlit unicorn is perfect for pillows or quilts. 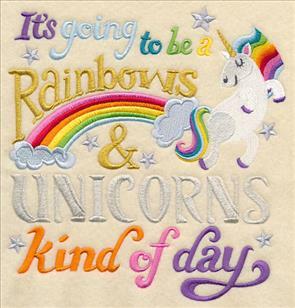 6.61" x 7.77" and 5.85" x 6.87" and 4.85" x 5.69"
A rainbows and unicorns kind of day? Now that's something to celebrate! Stitch this sweet sentiment onto pillows, aprons, framed wall pieces, and more, and maybe your next great day will be just around the corner. 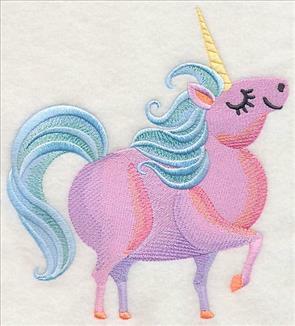 7.37" x 7.78" and 6.88" x 7.26" and 5.88" x 6.21" and 4.88" x 5.15"
Sweet and adorable unicorns are the perfect choice for stitching on kids decor, updating your favorite tote bag, or for simply adding a little light to your life! 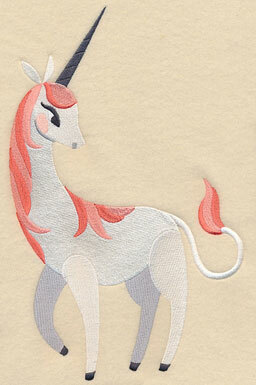 We love how each of these unicorns are cute-as-a-button, but in different (darling!) ways. 6.90" x 9.44" and 5.70" x 7.80"
4.86" x 5.40" and 3.46" x 3.86"
If you're looking for a non-traditional unicorn design, look no further. 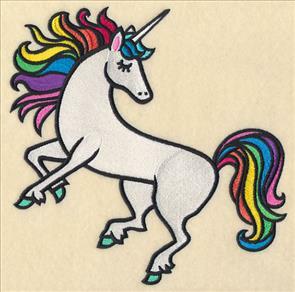 A mystical, colorful unicorn prances on the left, while a fun and funky unicorn struts its stuff on the right. 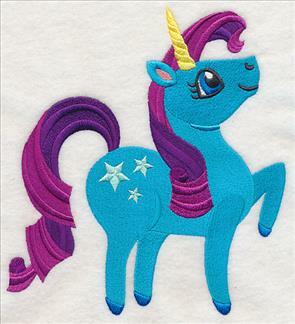 Stitch the mythical beings on denim jackets, backpacks, shirts, totes, pillows, and more! 6.90" x 9.14" and 5.86" x 7.76"
6.90" x 11.01" and 5.86" x 9.35"
4.90" x 7.81" and 4.30" x 6.85"
Pretty coloring and whimsical stitches give a chic unicorn lots of style; a rainbow mane and tail amp up the fun factor. 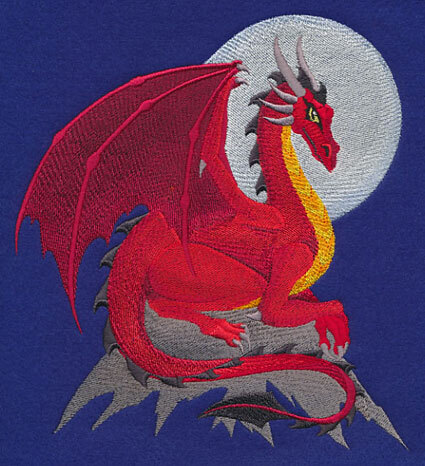 Each of these fantasy designs is a fabulous choice for stitching on totes, quilts, and wall hangings. 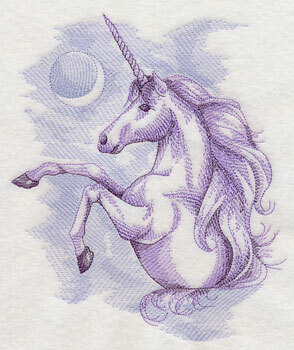 6.90" x 7.53" and 5.85" x 6.39"
7.82" x 7.74" and 6.97" x 6.90"
A roly-poly unicorn is full of whimsy and magic. Not only do we love how sweet the mythical being is, but we love the intricate color shading and gradients on this adorable design. 6.91" x 7.65" and 5.86" x 6.49" and 4.83" x 5.35" and 3.48" x 3.85"
This fierce dragon, inspired by Asian culture, is the perfect choice for stitching for the Chinese new year, Asian-inspired decor, or simply for your next fantasy-theme project. The vibrant coloring and patterns give this dragon a unique, eye-catching appeal. 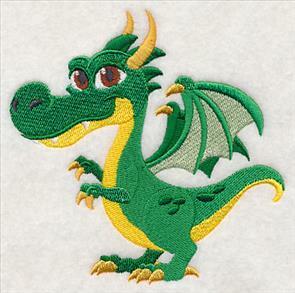 6.74" x 7.80" and 5.84" x 6.75" and 4.87" x 5.63"
A ferocious dragon surveys his mountaintop in this fantasy-themed design. Striking on dark denim jackets, quilts, pillows, and more! 6.88" x 7.53" and 5.83" x 6.38" and 4.88" x 5.34"
A storybook princess comes to life in this enchanted fairytale scene. 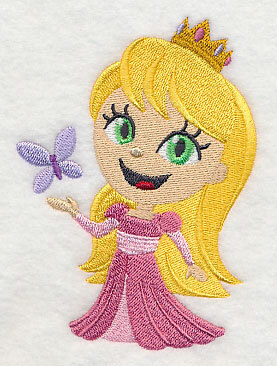 Stitch the entire design in metallic gold thread to give it a regal, magical look. 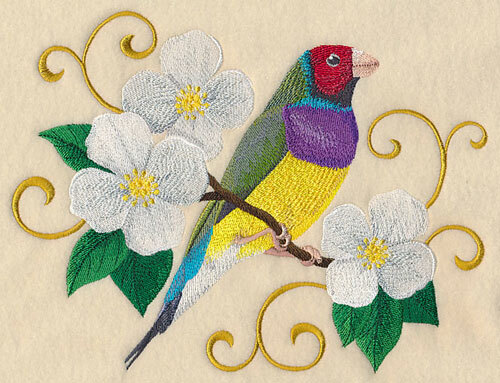 Get more information on stitching with metallic thread right here. 7.80" x 6.76" and 6.76" x 5.86" and 5.60" x 4.85" and 3.85" x 3.35"
The princess's gilded carriage makes its way to the castle in this metallic design. 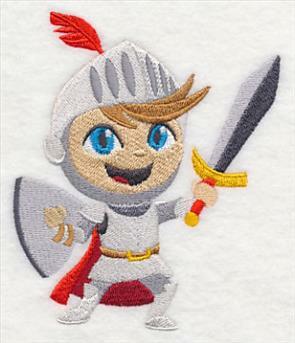 Stitch the storybook depiction on your next embroidery project -- great on pillows, quilts, linens, and more! A powerful dragon finishes the trio of metallic designs. 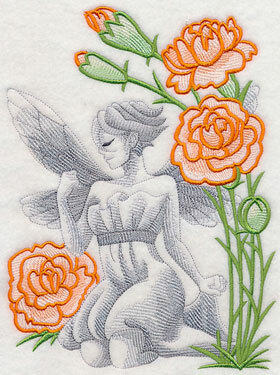 Stitch all three to tell an intriguing story, or use each on their own to spotlight the stitch work. Find helpful tips for stitching with metallic thread right here. 7.78" x 6.91" and 6.60" x 5.85" and 5.48" x 4.86" and 3.85" x 3.42"
Give the prince in your life a regal crown to wear with this freestanding Battenburg lace design. 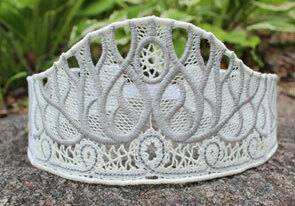 The elegant lace is perfect for mimicking the detail and style of a real crown. You can find step-by-step instructions for making this medieval crown, right here. 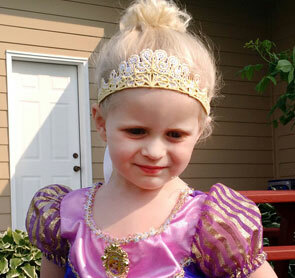 6.89" x 3.65" and 3.91" x 2.08"
Crown your favorite princess in a beautiful tiara fit for a true royalty. 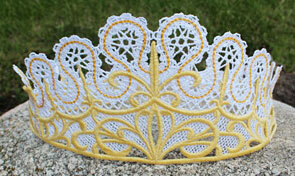 Click here for project instructions on making this freestanding Battenburg lace crown. 6.88" x 3.52" and 3.91" x 2.00"
The Gouldian finch, also known as the rainbow finch due to its colorful feathers, is a stunning bird native to Australia. Trish wrote in requesting a design of the unique feathered friend with a background of filigree and flowers, and we thought that idea was fabulous! Thanks for the suggestion, Trish! 8.89" x 6.89" and 7.54" x 5.85" and 6.27" x 4.86"